Hi everyone I thought this was an interesting read on how phone booths are making a comeback. Let me know what you think. For office workers, the phone booth out on the street corner once served as the go-to spot where private calls could be made free of eavesdropping co-workers. Mobile telephones helped kill that option. The metal-and-glass box with a phone fed by whatever loose change you could muster became obsolete when you could wander freely and talk on a phone. 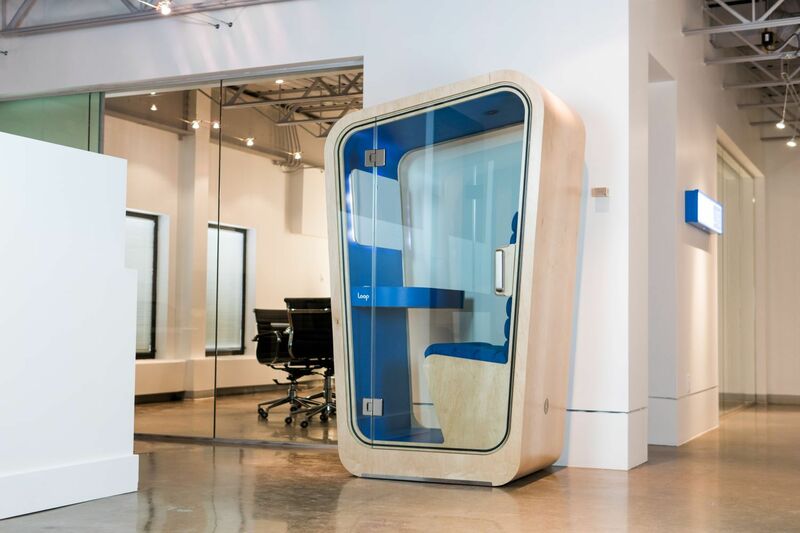 But the phone booth is making a comeback in the age of open office design and coworking space. This time around, though, the booth is fancier and more comfortable than its predecessor, and it doesn’t sit on a sidewalk. Startups are leading the way and business has increased exponentially. “It’s now a new category” in commercial office furniture, said John Ruder, chief executive officer of Boulder, Colorado-based TalkBox. Over the past decade, companies opted for an open office design to cut down on real estate expenses, picking up the pace in the past several years as office rents rise in a strong economy. It was sold as a boon for fostering collaboration and increasing productivity. But study after study is showing the opposite. Harvard University studies published last year found that employees tend to have fewer face-to-face interactions and look for ways to cocoon themselves, such as donning headphones, and don’t want to have serious conversations in public. And, the open space can be noisy and full of distractions. Red Idea Partners, a Boulder-based consulting firm, founded TalkBox in 2017 to give workers more privacy. At about $3,500 each plus shipping, the TalkBox sold “hundreds” last year to a list of companies that includes defense giant Lockheed Martin. This year, Ruder said the goal is to sell in thousands and do so mostly direct to the customer. TalkBox opted for a design that is neutral and easily fits into an existing space. Ruder said the company didn’t want clients to have to design around its product. “Design can be distracting,” he said. Like many of of the booths on the market, TalkBox does soundproofing, has ventilation so the user doesn’t feel like they are in a sweatbox and has power outlets for laptops or other devices. Some are set up for video and audio conference calls. TalkBox differentiates itself with one key element – less glass. While you don’t want people to hear what you’re talking about, you also may not want everyone to see your body language, Ruder said. Room got its start in a similar way as TalkBox. Brian Chen, CEO of New York-based Room, said he and his co-founder Morten Meisner-Jensen, each experienced privacy issues in prior startup companies and tried to develop a solution. “We didn’t fully understand acoustics” or ventilation so the first prototype indeed felt lacking, Chen admitted. Eventually, they settled on one that fit the goal of customer-friendly in price, delivery and assembly. Room’s start out at about $3,500 with no charge for shipping. With the design, the company wanted a young and fresh look with other startups in mind. “We didn’t want it to be old corporate America,” he said. But one of their “surprising discoveries,” Chen said, was that big companies and government agencies wanted to solve the privacy problem as well. They run the gamut from Sneakermaker Nike, the government’s NSA, search engine provider Google, rideshare company Uber and bank JPMorgan have bought Room’s booths. Since launching in the middle of last year, the company has sold products to 1,000 different businesses, Chen said. Investors took note. The company landed $2 million in additional seed money from San Francisco-based Slow Ventures, a firm that counts Nest, the startup that popularized internet-connected thermostats, among its investments. Google bought Nest five years ago for $3.2 billion. 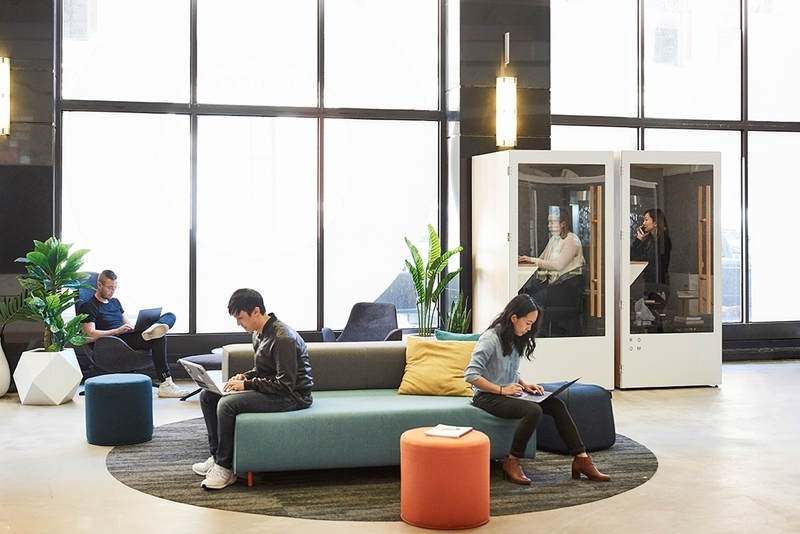 SnapCab, the Warrington, Pennsylvania-based maker of modular elevator interiors, got the idea for what it calls pods from a coworking company. 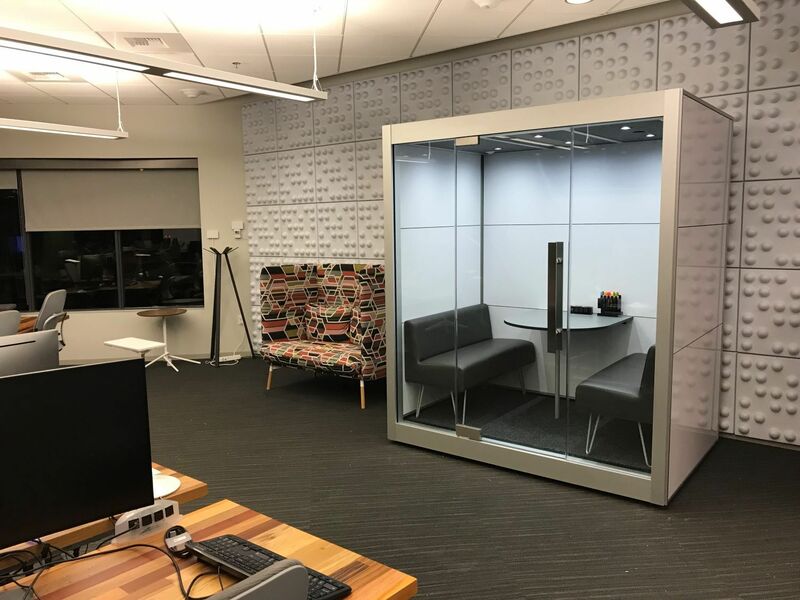 Glenn Bostock, SnapCab’s founder and CEO, said a consultant with WeWork approached the company at an American Institute of Architects convention and said the elevator interiors would work for creating private spaces. The company developed a prototype and showed it off at the commercial design industry’s NeoCon convention in 2017 and won silver award for workplace technologies. And the product looks a bit like an elevator. SnapCab has three different versions – a single, double and the biggest that seats up to six people. Bostock described them as “robust,” rated to survive earthquakes and capable of being outfitted with fire sprinklers. The pods compete on the high end of the market, and tend to be more expensive than others, he said. Unlike the others that sell directly to the customer, SnapCab last year partnered with Steelcase, one of the largest commercial office furniture companies in the world. Bostock said Microsoft helped design one of the latest versions of the pod, focusing on aesthetics and acoustics. In addition to Microsoft, SnapCab counts automaker General Motors and online retailer Amazon among its customers. At NeoCon’s June convention, the company plans to debut a design that has a connecting partition wall between pods that includes a whiteboard, creating a neighborhood of pods, he said. Across the U.S. border in Edmonton, Alberta, Canadian industrial design firm ONETWOSIX Design stumbled onto the business about three and a half years ago, said Nick Kazakoff, the firm’s president. Like SnapCab, the idea originated from life in a coworking space. The company was working with Mosaic Centre, a coworking building in Edmonton. It, too, struggled with privacy. ONETWOSIX did a couple of prototypes and the Loop Phone Booth was born. Loop booths come with seating and can be customized. Booths can cost between $8,000 and $12,000. Customers include Canadian e-commerce company Shopify, the New York offices of French beauty products company L’Occitane en Provence and the Bellevue, Washington, offices of Tokyo-based Pokemon. “It’s a bit of the wild west” for phone booths, Kazakoff said. “We’re just trying to grab as much market share as we can. Spaces is an occasional CoStar feature showcasing innovative interior design.